The Waikato is a region of lush, green hills, bush and farmland, with exceptional surf on the West coast. Throughout the region discover bush-clad mountains, stunning waterfalls, hot mineral pools, beaches and, of course, the magical limestone glowworm caves in Waitomo. 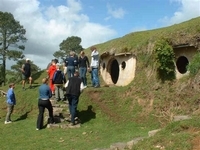 Why not also visit Hobbiton – the film location in the Lord of the Rings trilogy.